The Shark is a frightening, yet oddly fascinating animal. They are creatures of Power and Dominance, and have haunted mankind's nightmares since the days when we first conquered the wild seas. It is for these very reasons that Hollywood movies like Jaws and Deep Blue Sea have become mega blockbusters; we're simply transfixed by these terrifying behemoth. But there's much more to these fearsome predators than meets the eye. Seasoned seadogs have a long tradition of inking their bodies with Shark Tattoos in an effort to invoke the blessings of the gods and bid for their protection for a long, dangerous voyage. Images of sharks are badges of honor used to show that sailors have no fear of death. In Hawaiian mythology, sharks are ancient gods and by engaging in a specific ritual, beloved relatives could be transformed into powerful being upon their deaths. These ancestors, known as 'Aumakua', would continue to protect their descendants, which is why most native Hawaiians willingly throw food to Great Whites that swim too close to the shore. The tradition follows the legend of Kamohoali'i, the most popular Hawaiian shark god. In many indigenous cultures, sharks are seen as the spiritual bridge between the land and the sea. In Fiji, the shark god, Dakuwanga, protects fishermen at sea and devours lost souls. From Australia to the Hawaiian Islands, native folklore speaks of shape shifting sharks that freely roam everywhere. Sharks are symbolic of an aggressive lust for life. When observed in their natural element, they are constantly in motion, even while they sleep. For many persons, this represents their views of living life - go hard or go home. Persons with a shark persona live every day to the fullest and go 'full speed ahead' when it comes to achieving their goals. They are passionate in their pursuits and it is this trait that makes both sharks and persons with shark personas the top predators of the shark tank of life. People with an affinity of business also have shark personas; while they may be a mess on the inside, at face value, they are cold, calculating, and aren't completely consumed by their emotions. Simply put, they have an excellent poker face! Great Whites are, by far, the most popular sharks in history. From the classic movie Jaws to the latest flick Deep Blue Sea, Great Whites are fodder for Hollywood blockbusters and active minds. Great White Sharks are the ultimate predators and symbolize the quintessential characteristics and features that we have come to expect from sharks. 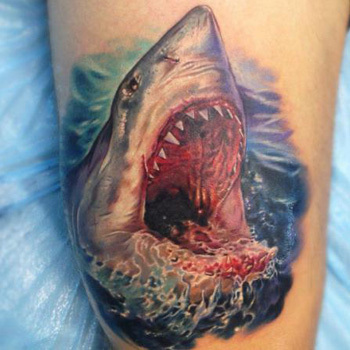 They are clever, aggressive, ruthlessly efficient, and unbelievably imposing, as such, many people who see themselves as being at the top of the 'food chain' are quick to get a Great White Tattoo on their bodies. In Hawaii, the mano kihikihi or hammerhead shark is revered as a guardian. Legend has it that they help to protect swimmers and sailors from the deadly man eater, the Great White Shark. Seeing a hammerhead in the water means that the gods are watching over you and children born under the sign of the Hammerhead are believed to be natural warriors. A Hammerhead Shark Tattoo means that you are a protector and guardian who is always ready to keep watch over your loved ones. With the advent of globalization, tribal tattoos have become relatively commonplace and it isn't uncommon to find many tattoo designs, including those that feature sharks, have details that associate it with a particular culture. In indigenous regions across the globe, tribal markings bear cultural and spiritual significance. Each pattern has a specific meaning which is closely guarded by the tribe's elders and spiritual leaders. Having a Tribal Shark Tattoo is a great way to connect with the spiritual energy of the fearsome shark and identify with the native culture of a region. You have a strong bond with Nature and the element, Water. While it's true that sharks have a fearsome reputation, who says that persons who identify with this terrifying creature don't have a playful side! Who doesn't remember cartoon classics like Jabber jaw and Street Sharks that feature colorful, shark characters? If Lenny the Shark from Shark Tale had you in stitches, then perhaps getting a Cartoon Shark Tattoo may be something that's up your stream. Although these designs speak to your playful nature, people around you should be aware that beneath your calm surface lies a deadly shark persona. When it comes to creating your body art design, there are a few axioms that hold true. Any tattoo artist will tell you that it is best to create a design that speaks to your personality and the message that you're trying to communicate to the world. Your new ink will not be easily removed with a magical eraser, so investing the time now to create a masterpiece will save you years of regret and wads of cash later. If you need inspiration, our team of tattoo artisans is happy to help. Simply visit our design page at www.itattoodesigns.com and take advantage of our Custom Design Service.